Bod Fontana [La Mancha/Ucles] - VINOS LIBRES "just honest wines"
Bodegas Fontana brings thirty years of family tradition to each wine they produce. 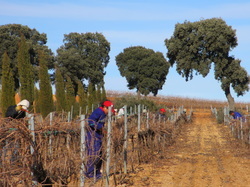 The Cantarero Morales family's commitment to making prestigious wines lead to their involvement in the establishment of the Unclés Denominación de Origen. With this new designation, their young, complex wines are now counted among the most prestigious in Spain. In addition to making flavorsome wines that taste great, the Cantarero Morales family is committed to growing their grapes and producing their wine in an ecologically sound way. With 500 hectacres in Unclés, Bodegas Fontana is one of the flagship wineries in this newly designated region. Why Is A New Denominación de Origen So Exciting? In short, it means that Bodegas Fontana's wines are among the best in Spain. A D.O. label signifies consistency, great taste, and superior quality. In order to qualify, all grapes used in the production of a wine bearing the label must come from within the region. So, each wine is molded by the unique landscape and weather conditions in which it was grown and produced- truly providing a taste of Unclés, Spain. Vintage Weather Conditions: Rainy spring. In summer the mild temperatures with a noticeable thermal fluctuation produce a slow ripening of grape and the appropriate sunlight hours developed intense fruit aromas with excellent color. 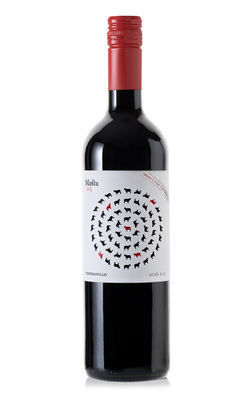 Tasting Notes: 100% Tempranillo - fruit driven nose with enticing aromas of ripe red berry fruits. Ripe and chewy tannins and a good concentration of ripe fruit that finish with firm tannins and good persistence. Vintage Weather Conditions: Rainy spring. In summer the mild temperatures with a noticeable thermal fluctuation produce a slow ripening of grape and the appropriate sunlight hours develop intense and fruit aromas. 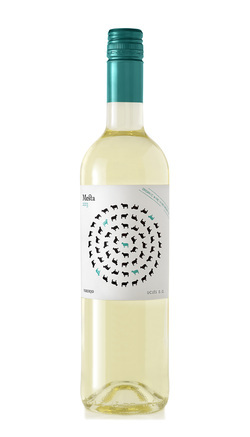 Tasting Notes: 70% Chardonnay, 30% Moscatel. Aromatic fruity nose, with pineapple and citrous flavors. Crisp with a good acidity, juicy, light and refreshing.